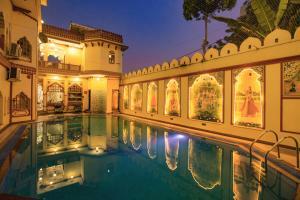 With a stay at Hotel Megh Niwas in Jaipur, you'll be close to Station Road and Hawa Mahal. This hotel is within close proximity of Ajmer Road and Sansar Chandra Road. Make yourself at home in one of the 24 air-conditioned rooms featuring refrigerators and minibars. 32-inch LED televisions with cable programming provide entertainment, while complimentary wireless Internet access keeps you connected. Private bathrooms have deep soaking bathtubs and complimentary toiletries. Conveniences include phones, as well as safes and desks. Take advantage of recreation opportunities such as an outdoor pool or take in the view from a rooftop terrace and a garden. Additional amenities at this hotel include complimentary wireless Internet access and tour/ticket assistance. Grab a bite to eat at Table dâhÃ´te Service, a poolside restaurant which features a garden view. You can also stay in and take advantage of the room service (during limited hours). Buffet breakfasts are available daily from 7:30 AM to 10 AM for a fee. When would you like to stay at Hotel Megh Niwas ? There is no front desk at this property. To make arrangements for check-in please contact the property ahead of time using the information on the booking confirmation. 24-hour airport shuttle service is available. Fees may apply. Contact the property in advance to get details. Taxes are subject to change based on Goods and Services Tax (GST) implementation. For more details, please contact the property using the information on the reservation confirmation received after booking. Each day we'll check prices and send you an email for your selected dates at Hotel Megh Niwas. If you don't have specific dates but would like to check prices for say next weekend or say next month we can check the price too. Click to write a review and share your experience of Hotel Megh Niwas with other travellers. D157/A Kabir Marg, Bani Park.